The Oscar®-nominated documentary short, Period. End of Sentence. , will launch globally on Netflix today, February 12th. 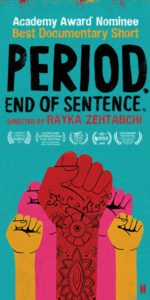 The film is directed by Rayka Zehtabchi and it follows a group of women and girls in rural India who work together to operate a machine installed in their village to make sanitary pads and combat the crushing stigma of menstruation. “Period. End of Sentence. came to life at the Oakwood School in North Hollywood, California. It is the brainchild of high school English teacher Melissa Berton, and several of her former high school students, including six who serve as executive producers. They came up with the idea when they realized that many of the girls in their partner school in India would leave school and stop their education once they began to menstruate, because they did not have access to sanitary pads. Seeking to raise awareness of this issue, the students made the documentary and formed the nonprofit, The Pad Project (www.thepadproject.org/), with the idea that a period should end a sentence, not an education. A two-pronged effort, The Pad Project works both to supply sanitary pad machines to women and girls in poverty-ridden villages around the world and shatter the stigma surrounding menstruation everywhere.